Ms. Pervin Divleli was born in Istanbul, Turkey and raised in Albany, New York. She earned a BA in Fine Arts and a Masters Degree in Early Childhood Education in 1992, with certification to teach Grades Preschool through 4. In 1999, Ms. Pervin helped establish Al Fatih Academy. Ms. Pervin was a co-director of the school since its inception, but retired from that position at the end of the 2007-2008 school year. 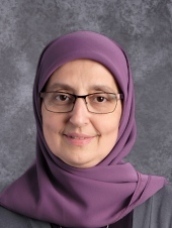 Ms. Pervin has worked to develop Al Fatih’s integrated curriculum as well as build it as an institution with strong foundations in high academic standards. Ms. Pervin has teaching experience in 1st and 3rd grade, but has spent most of her teaching career in Kindergarten. She taught in the Fairfax County Public School system for 5 years and has taught Kindergarten at AFA for 16 years. This year she returns to a leadership position as the Head of School. She prays that Allah gives her the patience and wisdom to do the best possible job she can this year.